Announcement I specialize in unique fabric combinations mixing, color, pattern and fabric designers. Almost any fabric in my shop can be used for any order, just contact me for availability. I love custom orders! I specialize in unique fabric combinations mixing, color, pattern and fabric designers. Almost any fabric in my shop can be used for any order, just contact me for availability. I love custom orders! Beautiful made! I could not have asked for anything more meaningful 💖 I will be ordering more myself and would highly recommended Monique to anyone!!! She was absolutely wonderful to work with! Just another day at the office! So many possibilities! Sewing up my best seller this morning. 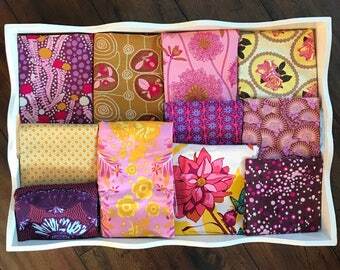 I will be sad when I run out of these vibrant fabrics! 32x32 patchwork and minky blanket using 8" squares. Random patchwork minky blanket using different size squares and rectangles. 40x56 quilt using 8" squares. Random patchwork quilt using different size rectangles & squares. My love of sewing began slowly when I got married in 1992. I sewed home dec type items out of necessity. I started quilting in 1994 after a miscarriage to keep my mind off my loss. 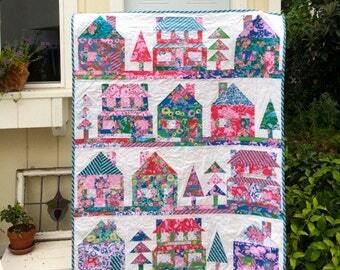 I was hooked on quilting after that and began to make bed quilts, wallhangings, etc. Some friends & family urged me to open an etsy shop and in 2008 I did and have been so pleased with the experience! Eventually, we added on a room that is over 200 sq feet of beautiful, creative work space for me to quilt and sew my heart out. I call it my happy place & enjoy being in it every day! I really love color & enjoy finding a fabric with an unusual color combination and designing a palette after that. Sometimes I'll see a stunning color combination somewhere in nature and pull some fabrics together to mimic that vision. I have allowed my etsy shop to change over the years to reflect what customers were asking for. I started off with tote bags and baby blankets & the blankets did really well, so I expanded from there offering different sizes and styles as well as traditional quilts. Eventually I added crib bedding to my shop as a natural addition to the baby blankets. Right now I'm focusing on patchwork and minky blankets and quilts with a diaper bags as I'm able to make them. I am grateful to God for every day I am able to sew and I get excited every day that I get to walk into my sewing room and play with my fabric. I give God the glory for my successes! I have been sewing since 1992 and quilting since 1994. I have always loved combining fabrics in unusual combinations, but could only give or keep so many! :) I am a born again Christian and give God all the glory for my success! Thank you for visiting my shop! I love to sew just about anything, but have saved my favorites for my shop. Many of my items are quilted. I really enjoy making custom items. I can make your custom item out of almost any fabric in my shop. At this time I am unable to offer queen size or larger quilts or duvets of any size. *Ready-Made Items: Exchanges or refunds are given if you are unhappy with the workmanship within 1 week of receipt of item. It must be in new condition and a refund or exchange will be for the purchase price. No refunds given on shipping/insurance/customs. *Custom Items: If you are unhappy with the workmanship, I will fix free of charge. They are not returnable because they have been made to your specifications. No refunds on shipping/insurance/customs charges. *Changes on your order: since I have been blessed with a successful shop and the wait time is 4 weeks for large orders, I try to order all materials necessary asap and start washing the fabrics and cutting way before your order is being sewn. That being said, if you change your mind about fabrics after you've paid there's a good chance we can't change anything without a fabric charge~ in other words you'd have to pay for new fabric+shipping and only in certain circumstances. I accept Paypal or Visa or Mastercard. If you live in the Conejo Valley area of California, I would be happy to deliver to you, and you can save on the shipping. WITHIN THE UNITED STATES: I ship USPS within 1-2 days after payment has cleared. Large orders will be shipped UPS if you are on the west coast. Insurance can be added at your request and expense- the charge will be added to shipping cost. I am not responsible for your item once shipped. INTERNATIONAL SHIPPING: If you live outside the US, please be aware of the customs charges. I do not refund any charges you incur for customs fees. There is no tracking for international orders unless you want to pay an additional fee. I am not responsible for your order once it ships. Generally it is double the shipping fee for tracking. Let me know if you want that included. I love custom orders! A request for a particular color scheme (such as pink and brown) is best since my fabric inventory changes continually. All items are made in a smoke free and pet free environment. At this time I am unable to offer queen size or larger quilts or duvets of any size. *Patchwork & Minky: patchwork on one side, minky (super soft polyester fuzzy type of fabric) on the other. I sew them right sides together, turn inside out and double topstitch around the edge. There is no quilting done, so the layers 'move' independently. They are cozy and 'hug' you because they are fluid, not stiff! I love these blankets because they look like a quilt, but don't cost nearly as much because there is less labor involved. *Quilts: patchwork top, batting in the middle, bottom cotton fabric. Layers are quilted together and a binding is applied to the edge. LOTS of hours of work, and the price reflects that difference. A classic sewing skill, when done right, yields beautiful results for years to come. Can I supply the fabric? Sometimes. Message me with a picture. It needs to be 100% quilting cotton. I give credit for fabric used on a project equal to $8 per yard. I'm sorry, but not at this time. There are many etsy sellers that specifically do this. Search "t-shirt quilts" to find them. Do you sell your fabrics used? Not usually. 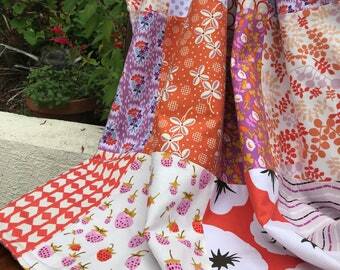 I buy 1/2 yard increments as most of my business is patchwork, so I don't have bolts of fabric in my studio. I have a scrap shop, sewfunscraps, here on etsy where I sell scraps & some fabric in yard size or smaller pieces.